Kapp Comet™ Flux has been designed specifically for the low temperature soldering of all common metals except Aluminum. It is an activated liquid flux, a mixture of inorganic salts in water, with approximately 35-40% active ingredients and excellent wetting properties. 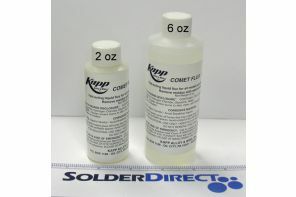 Kapp Comet™ Flux is highly recommended for use with KappZapp™ Silver solders on Copper and Stainless Steel. It is also excellent for use with all solders and metals except Aluminum when soldering temperature requirements are 350-550°F (177-288°C). Kapp Comet™ Flux is designed specifically to work with KappZapp3.5™ and KappZapp4™ solders to remove the oxide layer on Copper, Brass, and Stainless Steel required to form a strong solder bond. IMPORTANT: Overheating Kapp Comet™ Flux will be detrimental to your soldering project. Kapp Comet™ Flux will char above 550°F (288°C) requiring you to stop, let the joint cool, clean the joint, and re-solder to ensure a proper bond. The following chart represents the physical properties of Kapp Comet™ Flux. Many factors, such as materials, temperature, and method of application determine the most effective flux. Call Kapp for engineering assistance to discuss your specific needs. We recommend testing appropriate fluxes in your specific application to ensure suitability.